During the 1980s, our earlier years, members furnished quilts for all the beds in the Ronald McDonald House. Between 1990 and 1994, quilts were made and delivered to the Amos Cottage. We made quilts and wall-hangings for Habitat for Humanity Bird Fest fund raisers. Shortly after the devastation from Hurricane Floyd in 1999, we sent quilts and throws to North Carolina Quilters who then distributed them to the flood victims. In 1983, after acquiring our Non-Profit Organization status, we hosted our first NC Quilt Symposium and were awarded a small grant for a community project. As our project, we chose to make quilts for Forsyth Medical Center. Three gorgeous quilts were the result: a “Quilts for the Cure” pattern, a New York Beauty pattern, and an original pattern illustrating distinctive North Carolina features. Our guild advocates many programs and projects serving the entire Triad community. Preemie Quilts, a program started almost a decade ago, is currently an ongoing project. It involves members making preemie sized quilts for the neonatal intensive care nurseries at Novant Health’s Forsyth Medical Center located in Winston-Salem. During 2001-2002, our members made quilts, afghans and teddy bears for the Victory Junction Gang Camp. The camp was founded by Patti and Kyle Petty and was slated to be opened early summer 2004. This camp, located in Randleman, NC, is dedicated to serving seriously ill children. It is one of seven in the network of the Hole-in-the-Wall Gang camps originally started in 1988 by the late, Paul Newman. In 2008, FPQG members were called upon to assist a student at Paisley IB Magnet School with a school project. The project comprised of learning to sew, then making a few Preemie Quilts for the presentation delivery. A special sewing bee was assembled to help Alexis complete 10 quilts for her project. Thanks to all of our FPQG members and especially to Sew Original in Winston-Salem for their time, talent and energy. Alexis’ project was a complete success. For years, members of our guild participated in the Brenner Tree project. Members created hand-made Christmas Tree ornaments for the Festival of Trees. All of trees displayed were decorated by community-wide volunteers. The Festival of Trees was one of the largest fundraisers for the Brenner Children’s Hospital. Lottie Kay, President of ‘Friends of Brenner Children’s Hospital’ visited our February, 2009 meeting. Lottie thanked those who do and have participated in the Brenner Tree project. She said that as of 2009 they had raised over $100,000 for Brenner Children’s Hospital. For over 2 decades, the Festival of Trees benefitted the pediatric programs at Brenner Hospital, helping young patients and their families. Brenner Children’s Hospital is a part of the Wake Forest University Baptist Medical Center. Nap Blankets was started in July, 2009 and supports the “Equity Plus Schools” program in Forsyth County. Every few months we host workshops for members to create nap blankets for delivery in September. This past year we started the Lap Quilts project for the Neuro-science Center at Wake Forest Hospital. Lastly, it was recognized that through reusing, repurposing and recycling we could serve another need. Creature Comforts is the brainstorm of Karen Fridy. We use our cut-up and diced-up left-over fabrics usually thrown away to build beds for our furry-family members. In May 23, 2011, Joplin, Mo. suffered a devasting tornado killing 116 victims and turning the lives of many remaining residents upside-down. The Forsyth & Piecers Quilt Guild provided a small monetary offering. 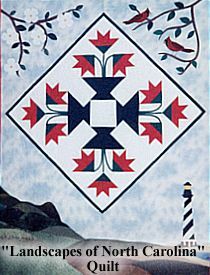 All of the Forsyth Piecers and Quilters Guild projects have promoted the art of quilting in some form or another. From time to time, outside sources will provide supplies to our group for creating and making quilts that will help others. Our community of quilters exploits this opportunity to further the bond that is known of quiltmakers. Each and every one of us love what we do and have a great time at it. We welcome new members to join us in continuing these charitable projects for the betterment of all. Feel free to visit us.